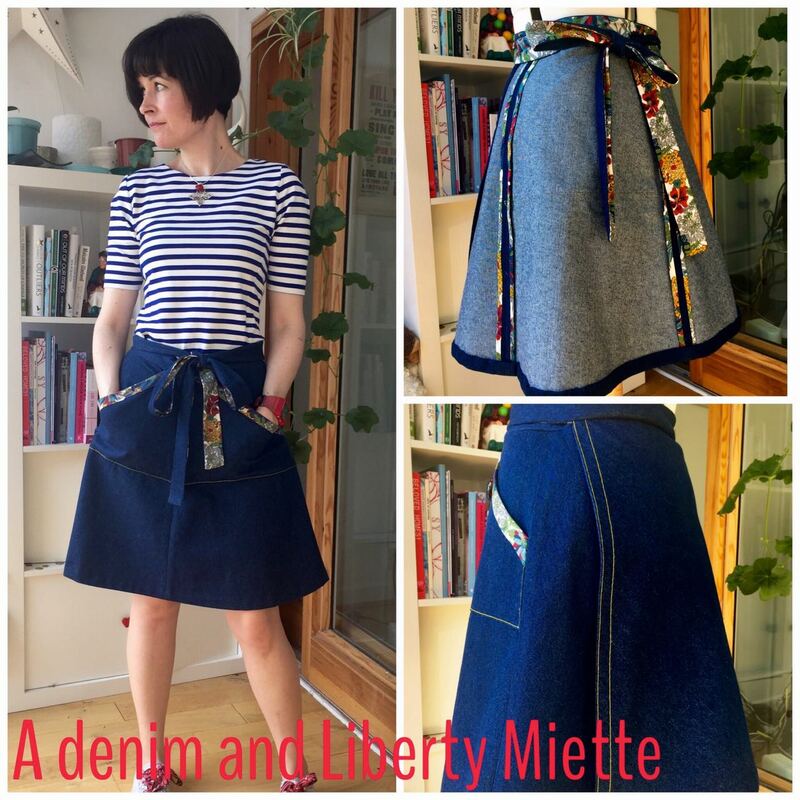 I’ve had my eye on making a Miette skirt from Tilly and the Buttons for a while. 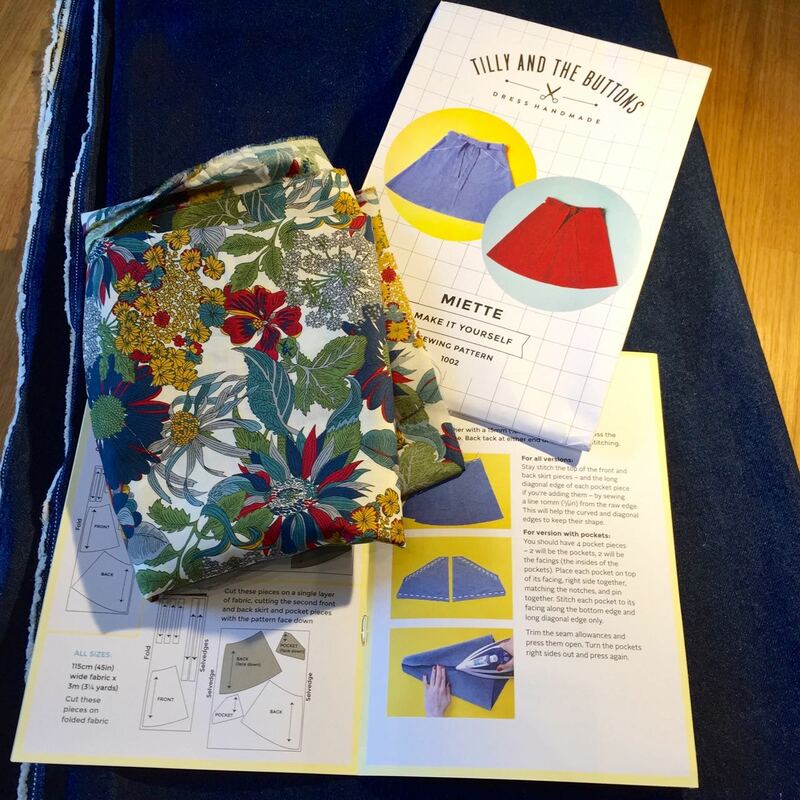 I bought both the Miette and the Coco patterns from The Stichery in Glasgow. They really are beautifully printed patterns with heavy paper for the pattern sheets and gorgeous printed instruction books with colour photos (the pdf versions don’t have those for some reason). 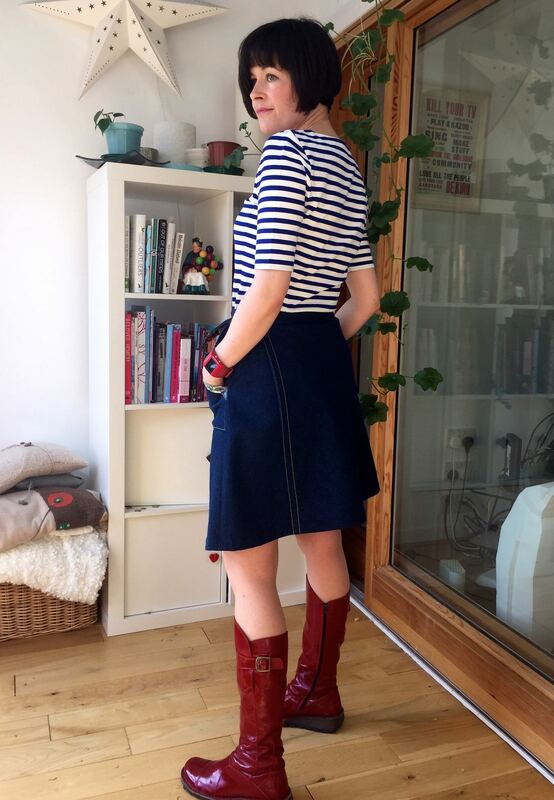 The Miette is the first T&TB pattern that I made but have since made a very speedy Bettine dress and most recently a very bright stripy Agnes top. I have started a Coco too but for some reason I just can’t seem to finish it. The only measurement you need for this pattern is your waist- super easy. This is a lovely pattern to sew with only 5 pieces to work with! 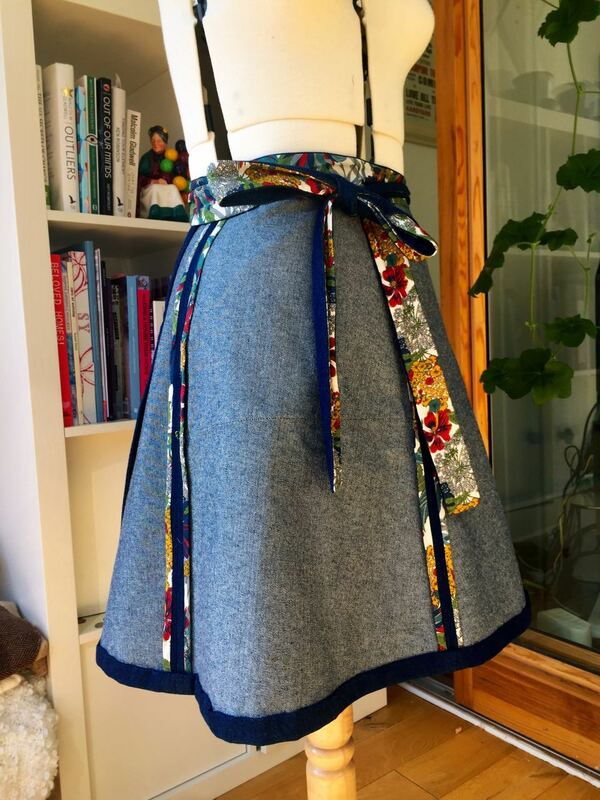 I chose a medium weight, dark indigo denim with Liberty tana lawn in the print Angelica Garla A for the facings and to trim the pockets both from Mandors in Glasgow. I cut both the belt and pocket facings from the tana lawn and then made some nice wide bias binding to use on the pocket edges. I debated about using flat felled seams on the sides but decided they would make the skirt more casual than I was looking for. 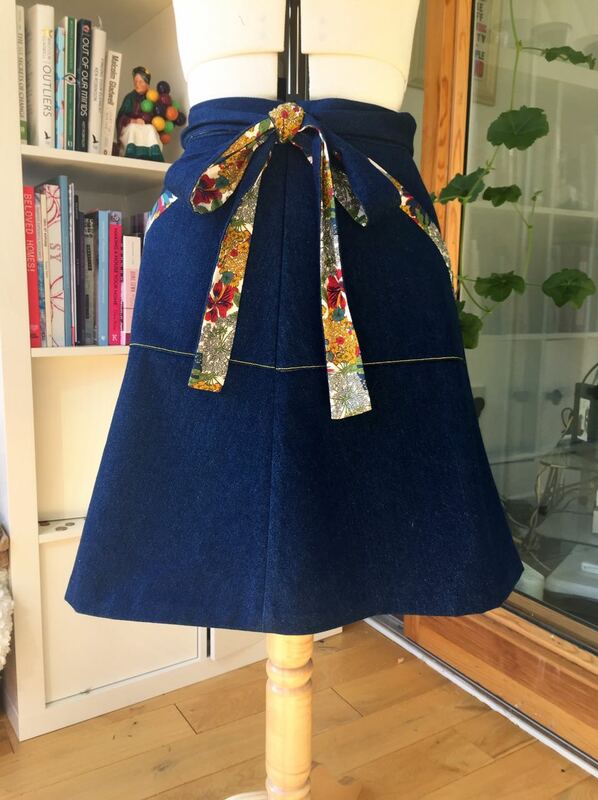 I wanted a wee nod to the fact it was a denim skirt without the jeans look. 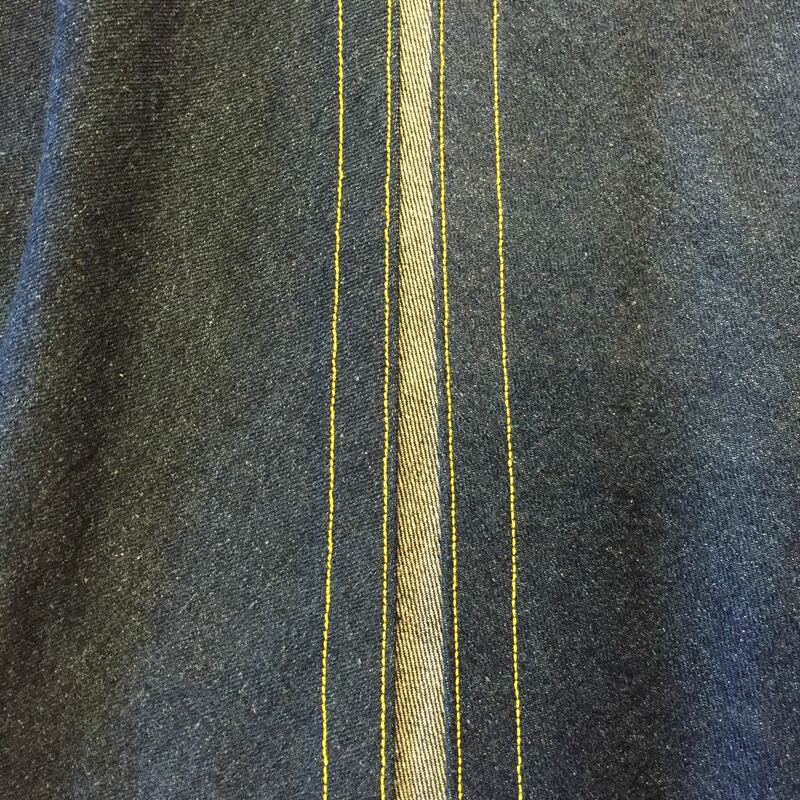 In the end I decided to use topstitching thread in bright yellow to edge the pockets. It was my first time working with proper topstitching thread. I used normal thread in the bobbin as recommended by Tasia, of Sewahollic fame, in her very helpful book The Sewtionary. I did have to play about with the tension and foot pressure to sew over the bottom of the pockets because of the thickness of the fabric layers. A tension of about 3 and foot pressure about 2.5 seemed to do the trick on my machine. It did take a few attempts to get it right though so the stitches looked even all the way along! 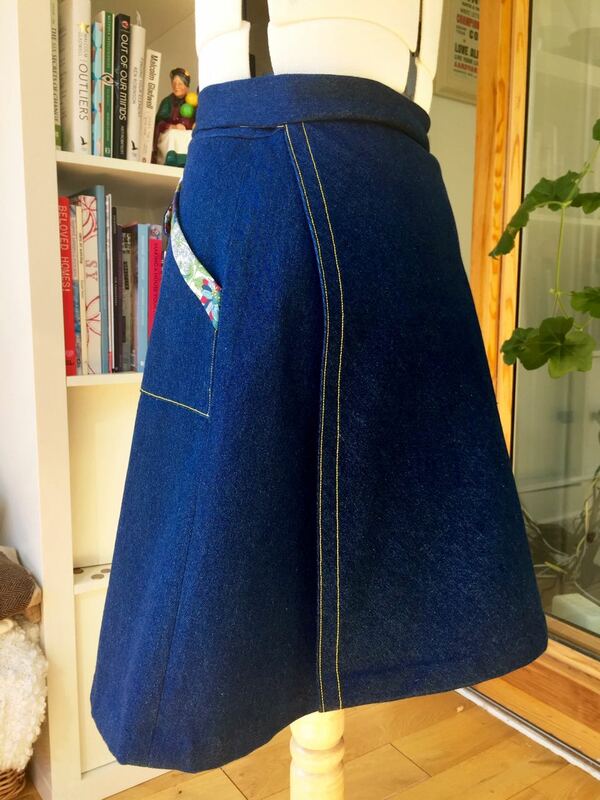 I then added a double row of topstitching on both the back edges of the skirt (slightly jeansy in look). I debated what to do with the raw edges on the inside. The easy option would have been the overlocker but that didn’t quite feel right. Since it’s a wrap skirt the insides feel more visible so I decided to bind the edges. 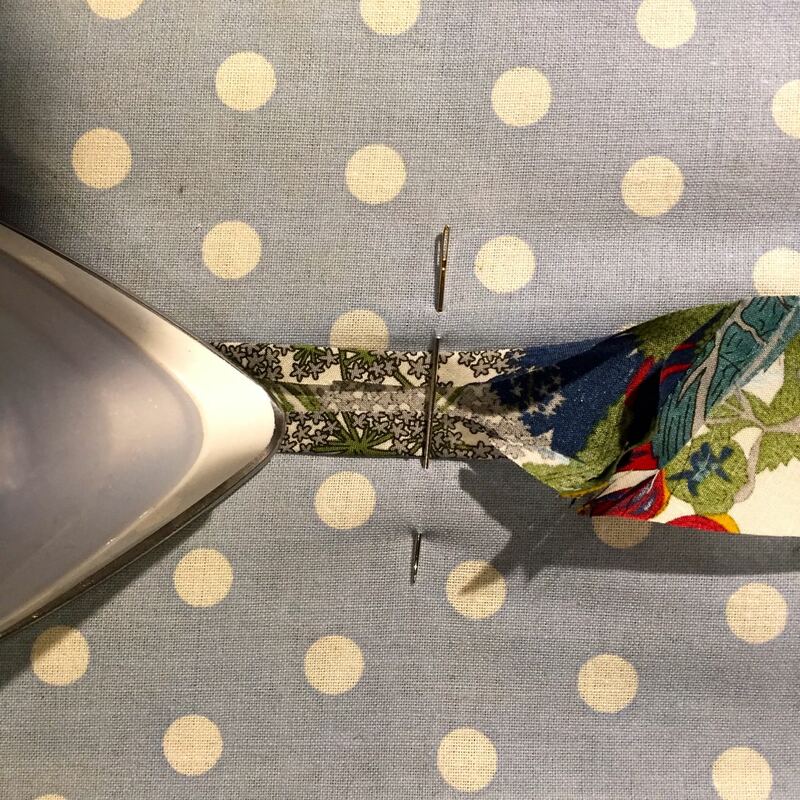 I didn’t have a bias maker in the right width to hand so used this very clever trick using a needle pinned to the ironing board at the right width from the Creative Little Daisy’s blog. It works really well except the tana lawn was a nightmare to work with and my binding was waaaay less than perfect. By the time I came to sew it to the raw edges a bound finish turned into a Hong Kong finish. I’m still pleased with it though. The only decision left was whether or not to bind the hem (after taking a couple of inches off the length) and, thanks to a little help from fellow Instagrammers, I just hand sewed it. 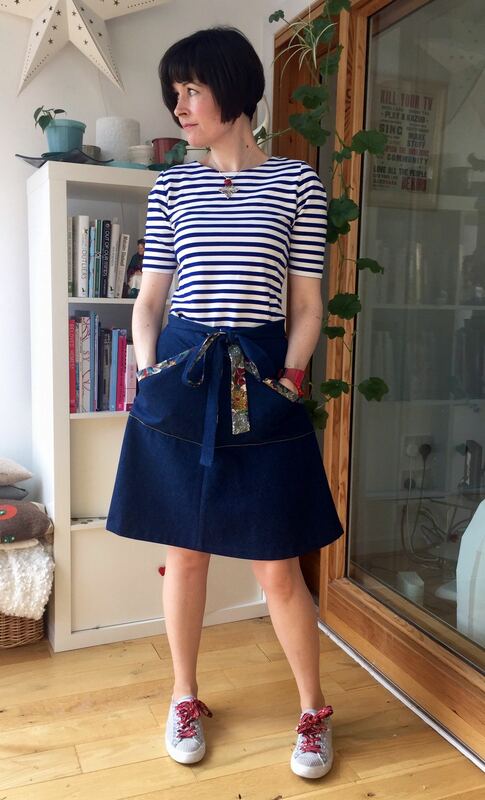 This is a lovely skirt to wear- there are sooo many ways to wear it and I’m sure I will make more.